Other names: Umbu, Brazil plum. Imbu is native to the dry plains of the northeast Brazil. It is gathered in large quantities from the wild by the local people and is a very important food resource for them. It is also said to be the tastiest fruit in the entire genus Spondias. Imbu has caught the attention of many organizations during the recent decades and has been recommended for domestication and cultivation as a commercial orchard crop. 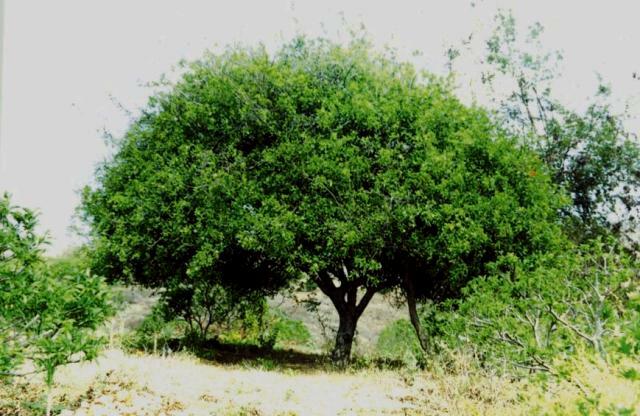 A low-branching tree 4-5 m high, spreading to a width of 9 m.
Leaves pinnate, compound, having 5 to 9 oblong-ovate leaflets which are 2.5-4.5 cm long, sometimes faintly toothed. Flowers, small, white and 4 to 5-petalled, borne on 10-15 cm long panicles. Fruit, more or less oval in shape, 4 cm long with greenish yellow, fairly thick, though skin and tender melting pulp; taste acid when unripe but sweet with a distinct aroma when ripe. Stone adherent, 2 cm long. Imbu is a very prolific bearer and bears very heavily. A grown up tree can produce up to 300 kilos of fruit in a single harvest when it reaches maturity The fruits are very much liked by the local people and gathered from the wild in large quantities during the season. These are then sold in village markets. The fruits are eaten fresh. Their juice is blended with milk and sugar and made into ice cream, jelly, fruit cheese and many preparations. Imbu tree has a shallow system of soft, tuberous roots called cunca, which store much water. These are consumed in emergency as a source of water. The roots of imbu tree can hold upto 3000 litres of water during dry season. Imbu is a plant that can grow under very harsh conditions. The trees are raised from seed. The seedlings have a long juvenile phase and come into bearing in 8-10 years. As the imbu trees in nature are all seedlings, so there exists a considerable variation among them regarding fruit size and other characters. Therefore there exists a great scope for clonal selection in this wild growing fruit. 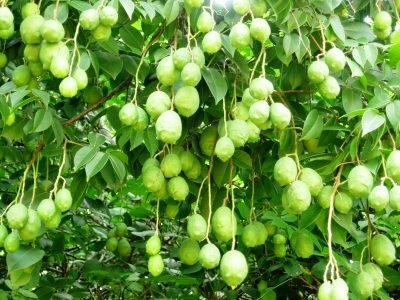 The imbu offers is a very potential new fruit for arid tropical regions due to its ability to grow and bear heavy crop even under the harshest of conditions.